Harbor Freight 6.5HP Clones on SALE again. Get your COUPON here. Just received my weekly Harbor Freight sale-email. The clones are on sale at $99 with coupon. Sale price only good from 9/22 to 9/27/08 limit 5 per customer. I just bought one about a month ago when they were on sale for $129. :censored: :mad2: The manager had to retrieve one from the back for me at the time. I told him that I had heard that these engines sometimes go on sale for $99 & then I asked him if he knew when that may happen again. He replied that he had worked there several years & couldn't remember the engines ever selling for less than $129. Here's the coupon guys... Go get 'em!!! how are we suppose to use that coupon. will they take it if we copy and print it out or what. Yep. Just print it out and tell em you got it in your e-mail. Are the "Greyhound" engines Lifan or not? Print it out. Carefully cut it out (Maybe you better ask someone to do this for you). Take your new coupon & a hunnert dollar bill to your local Harbor Freight & git yerself a new enjun. Here's something else to consider. If they are all sold out, or you happen to be broke right now. Ask for a rain-check. Might take a bit of good ole charmin' to get yourself a rain-check if they have plenty in stock. I don't know if HF has a Lay Awake plan. Alright men... Go get 'em. Let's see how many we can pick up by the end of the sale. I'm not sure on that one. It usually doesn't take much lookin' to find the word Lifan cast on the block somewhere or a sticker. I can't recall which of the two is on mine (cast or sticker) but it was pretty easy to see. Yup Lifan for sure. Remember pulling the sticker off of one of mine. If you don't want to use that coupon sign up on line for their email flyers it may not be too late to get your own I got mine today. They will not accept a printed copy. I have printed them and used them. There is a link to click on under every coupon to print it. Gentlemen, Don't make this any harder than it is. HF regularly sends out an email with sales & coupons. There are directions to print out the coupon to use it. I have saved you that step. Just print out the coupon in my first post & you're good to go. I wouldn't wait very long. I think they will go fast. Can you order them online with a coupon code? I've never bought anything from HF before and would like to buy one of these engines for a non-minibike application. My nearest HF is almost 100 miles away. Can someone send that picture to my email address? Its apperently blocked by my work pc's and I cannot print it. The store is literally right next door to my work. If someone sends me the actual picture I can open it in email and print it out. I would appreciate it. Dood I just bought one last week for 129-15% I done know if its worth 19 bux to try and get a refund. So it sounds like if you have a HF near you,your good to go.If not to bad.Got it. Thanks for sending the pic! I Got one of the last ones they had. O yeah... Its a Lifan.. If you read the small print on the Coupon, it will answer several of your questions. I learned a few things today. The regular coupons that are available in the mailer that you receive in your mail box or pick up at the store. Does NOT have this $99 coupon in it. It appears this coupon is only available to those who subscribe to HF's online flyer's. The regular coupons do have a coupon for the 9HP Robin engine. Sale price is $299! This coupon had small print that limited the sale to one engine per customer. Plus it was not valid if reproduced in any way. It looks like you can copy & print the online coupons all you want, but not the regular ones. I had to step out of the line to contemplate this unplanned development. I went ahead with the clones. 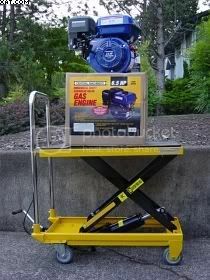 I also picked up a small hydraulic lift table. I think it will be real nice to get bikes up to a level that will be more pleasant to work on. My local store only had 5 engines in stock when I called this morning. If you're planning on getting one. You might want to call ahead to verify inventory & ask if they will accept a reservation. So... How many of you have a new 6.5 at home? 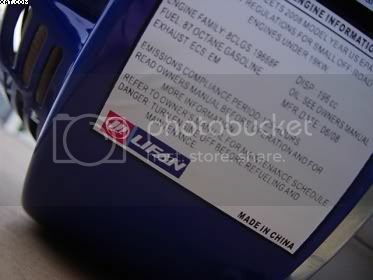 So has anyone used this Lifan 6.5 engine for any length of time? I was curious to know how long/well a $99 last.Also what about parts,are they readily available?